Last Monday, the 21st, I joined with nine other local birders - Dr Jose Padilla, Vince McGrath, Stan Damen, Dr Ken & Ruth Parks, Dave & Tammy McQuade, Ruth Woodall and Sheryl - to make a return visit to Ft DeSoto Park in Pinellas County to enjoy the migration activity at this hotspot. Our group arrived at Ft DeSoto at 8 am and headed straight to the mulberry trees at the rangers' residence. Dave and Tammy already had several great sightings as we approached including a Worm-eating Warbler, Rose-breasted Grosbeaks and Baltimore Orioles. After an hour or so we relocated to the East Woods Picnic Area with the expectation of finding lots of great warblers. However this proved not to be the case. We did find some warblers, but not lots. We had a few Hooded and Palm Warblers, but the group help put me onto one of my nemesis birds in a Kentucky Warbler. Apparently he had been spending a lot of time with a Hooded Warbler feeding underneath a large mulberry tree. We also got to observe a nesting pair of Nanday Parakeets. As the action was slow we headed to the North Woods Picnic Area for some lunch. Which was interrupted several times with the arrival of forging warblers. Here we added Blackpoll, Cape May, Yellow, American Redstarts, Palm, Black-and-White Warblers, and Northern Waterthrush. The nearby lagoon added American Oystercatcher, Willet, Marbled Godwit, Reddish Egret, Short-billed Dowitcher, Sanderlings, Dunlin, Herring Gull, Laughing Gull, Foster's Tern, Royal Term, Least Tern, Cormorants, Brown Pelicans, Piping Plover, Semipalmated Plover, Black-bellied Plovers, Ruddy Turnstones and FOS Semipalmated Sandpiper. Dipped on any whimbrel or long-billed curlew. Next we made a return visit to the Mulberry Grove were found the action was still going strong. We added a Prothonotary, Ruby-throated Hummingbird and Eastern Wood-Pewee. From here our group left the park to bird the Cockroach Bay Preserve near Ruskin. The goal was to relocate a reported Lincoln's sparrow. We didn't find any sparrows, but have a few surprises. Dave was hopeful to add a Solitary Sandpiper. Well we found him fourteen. An added bonus was Jose locating a pair of Wilson's Snipes. We also added Mottled Duck, Blue-winged Teal, Redhead, Black-necked Stilt, Lesser Yellowlegs, Coots, Moorhens, Eastern Towhee, Roseate Spoonbills, White and Glossy Ibis, Ospreys, another Semipalmated Sandpiper, Least Sandpipers, a lone Black Skimmer, a Least Tern, Blue Grosbeak, Downy Woodpecker, Merlin and all the expected waders. In all it was a great day with the group totaling well over 110 species. Surprisingly we dipped on few expected species like sandhill crane, red-tailed hawk and swallow-tailed kite. Again it was a great day. Migration observations at the Sanibel Lighthouse have continued to be very fruitful. Dr Padilla called me about 3 in the afternoon to advice me as to a black-billed cuckoo being seen at the lighthouse. This bird is very uncommon in our parts and a chance to see one was compelling. Within an hour I have meet Dr Padilla at the lighthouse and we begin looking. The numbers of migrating birds present have dwindled a bit but we were able to find a few. I got my FOS Blackpoll Warbler busy feeding in a fig tree. The tree was popular as we found several Palm Warblers, a beautiful Cape May, a stunning Prothonotary, as will as Northern Parula, Prairie Warbler and Indigo Buntings. But what about the cuckoo? It had been observed by several birders in the morning and our friend Ruth Parks told us that she had just seen it near the restrooms. We staked out the area, but we could not relocate the bird on this afternoon. I could not return the next day, which happened to be Easter Sunday, but many birders did chase after the bird and it seems that everyone, besides myself got good looks. Please the this link to the Stokes blog page with photographs of the Black-billed Cuckoo. It is ironic that a couple of years age we also a a fuss about a black-billed cuckoo that stayed several days at the lighthouse. I also dipped on the bird on that occasion, Next time!! Our local hot spot, in Lee County, for Spring Migration, is the Sanibel Lighthouse. The location is on the southern point, Point Ybel, of Sanibel Island at the lighthouse park. Weather conditions determine how active the location can be for migrant observations. Blocking weather conditions can provide us with rewarding opportunities to see some interesting species. However, the optimum weather conditions, such as a strong tail winds, for the birds will push them past us as they rush to be on territory first. So far we have had a few good days here to observe at least a sampling of species are passing through. The most productive observations seem to be Eastern Kingbirds and Orchard Orioles. Gray Kingbirds are starting to show up along with Indigo Buntings and Blue Grosbeaks. We're seeing a few Western Kingbirds and a Scissor-tailed Flycatcher as well. As for warblers, the wintering Palm and Yellow-rumped Warblers have thinned out considerably. One of the most popular migrant warblers showing up are the beautiful Hooded and Prothonotary Warblers. Kentucky, Blue-winged, Worm-eating, Blackpoll, Black-and-white, Prairie, Cape May and Tennessee are being seen. 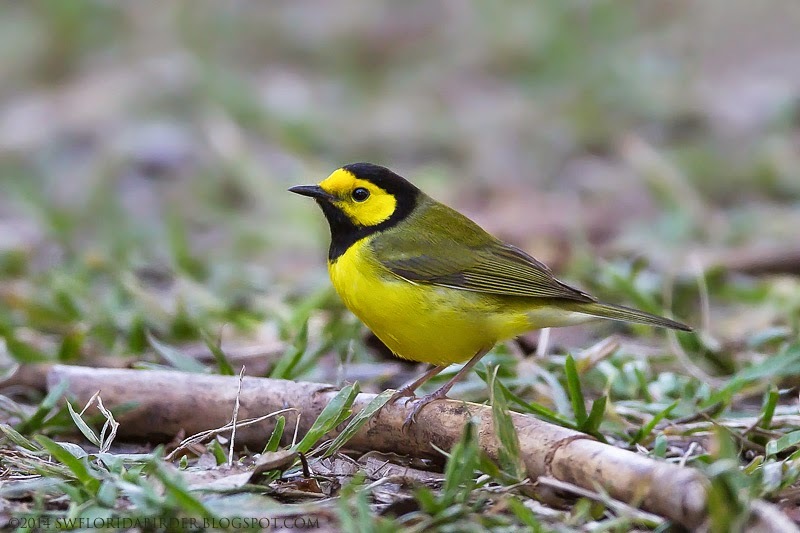 More variety of warblers should increase as the spring season progresses. It is possible to find Yellow-throated, Red-eyed, White-eyed and Blue-headed Vireos all in a single visit. Black-whiskered Vireo is a real possibility as well. Nearby Ding Darling NWR usually have a few pairs every summer. Other species being seen include Yellow-billed Cuckoo, Summer Tanager, Cliff Swallow, Baltimore Oriole, Painted Bunting, Chimney Swift and Wood Thrush. Some expected species include Swanson's Thrush, American Red Starts, Rose-breasted Grosbeaks, Magnolia Warblers, Eastern Wood-pewee and others. It can be a crap-shoot as to wither the birds will show or not. But is fun when they do. First off I want to wish my friend Ed, in Onalaska, Texas a Happy Birthday. Secondly we are seeing the start of the Spring neotropical bird migration. The earliest arrivals are trickling in with Hooded Warblers and Prothonotary Warblers showing up in good numbers. Today, in a late day visit to Ft DeSoto Park in Pinellas County, Bob Pelkey and I saw that Hooded Warblers had arrived in large numbers. They were hopping around everywhere. White-eyed Vireos are also abundant today. Other migrating warblers seen included Prairie, Northern Parula, Worm-eating, Louisiana Waterthrush and Black-and-White. Lingering winter resident birds included Black Scoter, Red-breasted Merganser, Redheads, Yellow-bellied Sapsuckers, Gray Catbirds, and Palm & Yellow-rumped Warblers. Nanday Parakeets, a family of Great Horned Owls and a Merlin were nice additions for the day. The beaches offered all the usual and expected shorebirds and waders. Earlier in the day I visited one of our local hot spots, Six-Mile Cypress Preserve, in search of migrants. Seen today included Great Crested Flycatchers, Black-and-White Warblers, Parula, Prothonotary Warblers, Pine Warblers, Black-throated Green Warblers, Prairie Warblers, Yellow-throated Warblers, White-eyed Vireos and Red-eyed Vireos. Lingering winter visitors included Blue-headed Vireos, Ruby-crowned Kinglets, Palm Warblers and Yellow-rumped Warblers, Gray Catbirds and Common Yellowthroats. This was a nice start for Spring migration. Hopefully weather conditions will allow us in southwest Florida opportunities to enjoy these colorful birds as they rush north to start nesting. A count for the reached 74 birds.